With less than 4 weeks to go until the Weston A. Price Foundation‘s Wise Traditions Conference in Atlanta, Aaron Zober interviews another speaker. Hannah Crum of Kombucha Kamp is able to take a break from her busy schedule, speaking at various conferences, festivals, and fairs, to make a return visit to the program and give a little preview of her presentation in Atlanta. Hannah will be part of the track on curing cancer with holistic methods as she talks about how kombucha is beneficial in keeping your gut healthy to avoid developing cancer and other chronic illnesses. Hannah discusses how the cultures that live the longest consumer lots of fermented foods, including kombucha. 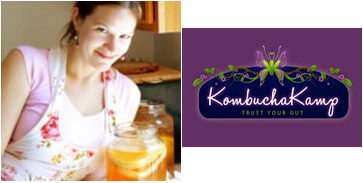 Hannah talks about other great probiotic drinks and other uses for kombucha and SCOBYs. Hannah also gets into the upcoming book she’s writing on kombucha and the Kombucha Brewers Association that she’s starting up.